This isn’t why it’s called that, but I like to think Breathless is called Breathless because of its cutting style – everyone knows how fast, jumpy, and kinetic it is at times now, and even over a half-century following its initial release, this 90 minute film expels that creative and loose feel. I can see why this is considered one of Jean-Luc Godard’s and the French New Wave’s most iconic films, it is quite entertaining and viscerally appealing. The events transpire over a couple of days in Paris. Michel (JEAN-PAUL BELMONDO) is a small-time thief who suddenly and casually kills a cop one day off the side of a road in a ditch. He meets up with Patricia (JEAN SEBERG), an American in the city selling the New York Herald Tribune. They have met before. She may be (and probably is) pregnant with his child. Or she may not be. Michel attempts to convince Patricia to flee to Rome with him, but Patricia has reservations, as she is worried of what criminal involvement or life might follow. You get the sense that Godard only wants you to be an observer on Michel and Patricia’s story, he uses jump cuts and brief music cues to show that they are there, we are here, and that is that. That music, composed by the jazz pianist Martial Solal, has a moody kind of feel to it – it perfectly suits the characters and the visual style of the film as it rolls along. And what is there to be said about the acting? 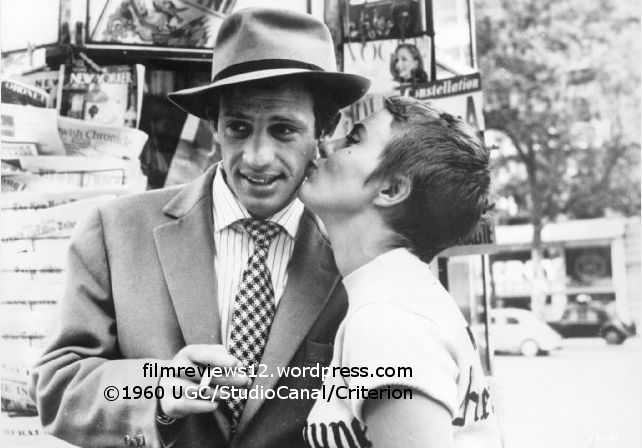 Belmondo exudes a cool, simplistic, Bogart-like exterior as Michel, hiding a more complex interior that is only subtly expressed in conversations with Jean Seberg’s character, Patricia. Seberg is solid as the character, learning about Michel as a seedy character as we do. As she takes a back seat in the proceedings and depictions of Belmondo’s Michel, it’s clear the character of Patricia runs, only slightly, behind us as the viewer. Naïve, however, she is not, as displayed by her actions that eventually lead to the film’s end. 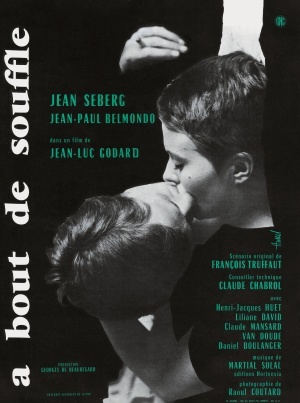 The story for Breathless was written, to an extent, by Claude Chabrol and François Truffaut (Truffaut is responsible for co-writing and directing The 400 Blows, my favorite of the films from the French New Wave I’ve seen). Godard made this picture in an off-the-cuff way. He would have ideas that he would have shot. As a result, depending on how many ideas he would have in a day, shooting could last anywhere from “15 minutes to 12 hours”. The execution of the actual story is disarmingly simple, perhaps a display of this method. Reviewing Breathless for a 2013 audience as opposed to 1960 audience brings up a couple of big challenges. First off, what individual with at least a passing knowledge of mid-20th century cinema hasn’t seen this film? Even more have heard of it. We’ve already drawn our conclusions on it. Second of all, we’re much, much too used to the method of the editing, which many argue Breathless helped originate in most kinds of filmmaking. Just about any music video from about 1980 onwards is loaded with jump cuts, and countless mainstream action and less mainstream films-in-general have extensively experimented with unorthodox and non-continuous cutting in concept and definition. With all of that in mind, Breathless doesn’t have the same impact on me as it has with everyone who’s seen it. I see it as a point of reference, not groundbreaking. I wouldn’t call it anything less than important, but not exceedingly great. Now that everyone has started to draft their angry comments, I feel this is a good time to start to wrap up. Breathless still pops off the screen after all these years, with its still out-there editing and handfuls of direct and indirect references to various books and movies. A certain part of that won’t ever go away, but it will become less relevant to the viewer as time moves on. We can read all we want about it and acknowledge what it means, but we can never have the same gut reactions as the first French audiences might have had on March 16, 1960.